TerraX completes high resolution airborne magnetic and radiometric and LiDAR surveys over the Quyta-Bell property. Vancouver, B.C. 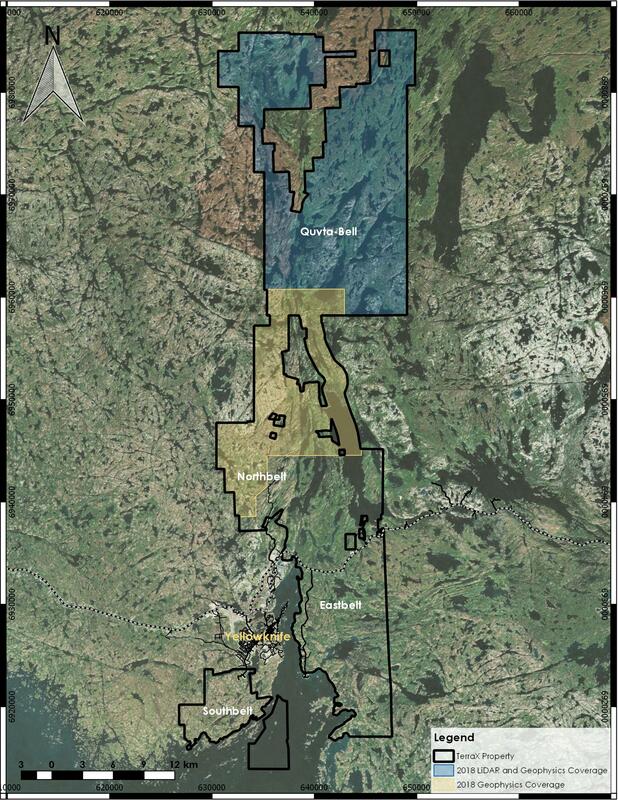 – TerraX Minerals Inc. (TSX-V: TXR; Frankfurt: TX0; OTC Pink: TRXXF) is pleased to announce the completion of a helicopter-borne high resolution magnetic and radiometric survey over the Quyta-Bell property of the Yellowknife City Gold Project (YCGP). This 6409 line-kilometer survey was completed by Precision GeoSurveys Inc., of Langley, BC. A 434 square kilometer airborne LiDAR survey was also completed over the Quyta-Bell property by LiDAR Services International Inc. of Calgary, AB. Maps of the airborne geophysical and LiDAR coverage are available here. These surveys received funding support totaling $160,000 (CDN) through the government of the Northwest Territories (GNWT) Mining Incentive Program (MIP). The MIP is administered by the Industry, Tourism and Investment ministry (ITI) of the GNWT. Dave Suda, President and CEO of TerraX, stated "These airborne surveys will be used by the TerraX technical team to better define potential gold mineralized zones on the Quyta-Bell property. The MIP funding provided by the GNWT was a key component to the completion of these leading-edge surveys. Their forward-looking approach supports innovative geoscience for use in mineral exploration throughout the NWT." The technical information contained in this news release has been approved by Joseph Campbell, Executive Chairman of TerraX, who is a Qualified Person as defined in "National Instrument 43-101, Standards of Disclosure for Mineral Projects." The Yellowknife City Gold Project ("YCGP") project encompasses 780 square kilometers of contiguous land immediately north, south and east of the City of Yellowknife in the Northwest Territories. Through a series of acquisitions, TerraX controls one of the six major high-grade gold camps in Canada. Being within 10 km of the City of Yellowknife, the YCGP is close to vital infrastructure, including all-season roads, air transportation, service providers, hydro-electric power and skilled tradespeople. The YCGP lies on the prolific Yellowknife greenstone belt, covering 70 km of strike length along the main mineralized break in the Yellowknife gold district, including the southern and northern extensions of the shear system that hosted the high-grade Con and Giant gold mines. The project area contains multiple shears that are the recognized hosts for gold deposits in the Yellowknife gold district, with innumerable gold showings and recent high-grade drill results that serve to indicate the project's potential as a world-class gold district. For more information on the YCGP, please visit our web site at www.terraxminerals.com.